Escape From China's Mystery Rooms! Have you ever wanted to be locked in a hotel room? Or even trapped inside a murder scene? Well fear not: your odd, twisted fantasies have sort of been realised in Beijing's newest craze, the mystery room escape! 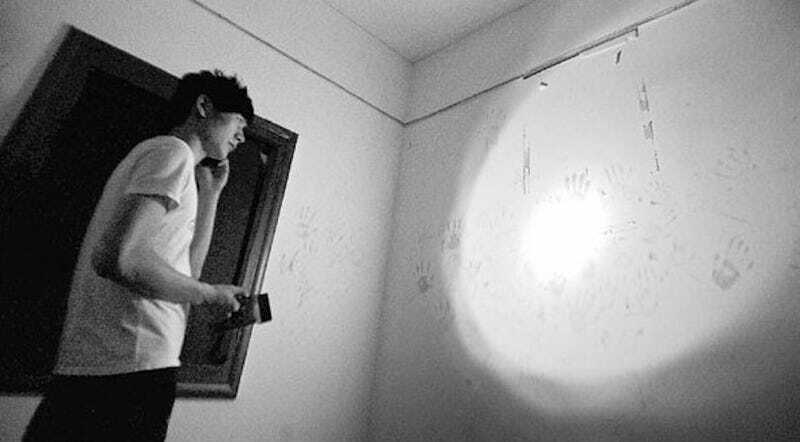 Mystery room escapes in Beijing are akin to a smaller-sized fun houses. Basically it's a locked room mystery where players have to look for clues to get out of the room in a certain time limit. According to the China Daily (whom I work for), these mystery rooms materialised in the physical world through the popularity of similarly-themed online point and click adventure games. There is a whole genre of these games which correlate with Locked Room Mystery novels. There have been a series of these games on PC. These hidden object games were so popular that it drove some people to create real life versions. Effectively what happens is that a group of people are taken into a room and they're locked in. The room can be dark, dimly lit or even completely lit; it doesn't matter. All they need to do is get out. Scattered across the room are clues on how to get out, and once the way out is ascertained, they move onto the next room, all the way until they are out of the maze. Each room escape has a different theme to it. Some are hospital-themed, others are murder scenes, there are even a few supernatural scenes. There is no photography allowed inside the rooms, with some organizers even asking patrons leave their phones with security before the game begins. Each game usually lasts about an hour. If you're still inside the game after the clock runs out, the company staff will come and release you. The games cost about $10 per person and offer a decent amount of entertainment. It's slightly cheaper than a movie ticket in Beijing and it offers some form of interactive exercise. The reservation specialist, surnamed Qu, at one of the more popular mystery rooms located in Beijing's university district, says that the events are great for team building exercises. "We have a lot of college students and a lot of white collar folk come in," said Qu. "It's a great way to exercise the brain and decompress after a long week of work or study." Qu says that the establishment he works at is usually most popular during the weekends. He also said that they have cameras installed all over the maze to monitor the players' safety and progress. Zhang Qianhui, a college student in Beijing, said she enjoyed her time at the mystery room. She said she'd probably do it again if she could find a harder and more challenging one. "The puzzle wasn't hard, but there were some tight spaces to squeeze through," said Zhang. "The one we went to had a lot of crawling on the floor looking for passages, it wasn't very good for my jeans."